San Diego, CA and Armonk, NY, March 17, 2009 -- Researchers at the University of California, San Diego today announced plans for a new campus center dedicated to inventing the next generation of virtual worlds, multiple player online games, and high fidelity digital cinema, using one of the world's most sophisticated computer servers -- the IBM System z mainframe. Sheldon Brown (far right in foreground) is the PI on the project that will use the donated IBM mainframe to help build a global virtual world based on Brown's "Scalable City" interactive museum installation (pictured above in the gallery @ calit2). IBM (NYSE: IBM) provided a Shared University Research (SUR) award to help the university jump-start its new Center for Next-Generation Digital Media on the UC San Diego campus. In addition to multiple peripherals and additional support, the IBM award consists of the company's newest System z10 Enterprise Class server with the Cell Broadband Engine (Cell/B.E.). "Students will have access to IBM's newest hybrid computing system with blazingly fast and powerful capabilities. UCSD students can now tap into security features and 'specialty engines' designed to handle a new generation of virtual world applications, where massive numbers of simultaneous users can share a single environment," said Bernie Meyerson, IBM Fellow and vice president of Systems and Technology Group. "We want to facilitate the invention of the next generation of digital media," said Sheldon Brown, a visual arts professor at UC San Diego. "By significantly increasing the experiential richness of virtual worlds, we think they will become a proving ground for creating and interconnecting digital media of all forms, starting with games and cinema. As virtual worlds and digital cinema develop more visual sophistication and cultural literacy about how we use them, they will start to intersect and will become much richer and more complex." "Scalable City" will go from being a single-player interactive museum piece to a full-fledged virtual world accessible via very broadband connections worldwide. 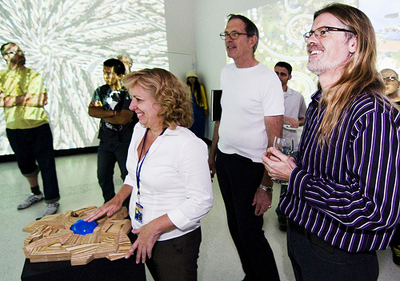 Initially, Brown and his team in UCSD's Experimental Game Lab will use the IBM System z server to develop and operate a virtual world based on Brown's museum installation "Scalable City," extending it to be experienced by potentially thousands of simultaneous users worldwide 24 hours a day and seven days a week. Users could potentially experience a more visually and behaviorally complex virtual world than current efforts as seen in Second Life, The Sims or other massively multiplayer online role-playing games, such as World of Warcraft. To date, a lack of computing power has limited what users can see in virtual worlds, which may have thousands of users and hundreds of thousands of objects. When users have moved to different parts of the virtual world, they moved to different computer server nodes in the computing cluster, which resulted in making the experience of the total world very fragmented. According to Brown, IBM System z mainframes offer just what the virtual worlds of tomorrow will need. The system's high volume processing capabilities combined with the dense computing power of IBM's Cell/Broadband Engine multiprocessor technology puts real-time interaction in a virtual world within reach for users. The IBM z10 mainframe will be located at the San Diego Supercomputer Center. "The IBM mainframe can look like a couple hundred computers in a cluster, or look like one giant computer. We can optimize tradeoffs between storage and processing, which we can use to change the shape and nature of the virtual world experience," Brown explained. While IBM mainframes can enhance the real-time nature and verisimilitude of virtual worlds, the experience of users will always be limited, in part, by the 'client' side -- the personal computers with which users enter those virtual worlds. To that end, the UC San Diego researchers are already experimenting with multi-core processors for client-side computing, including the Intel chip code-named Larrabee, which won't be commercially available until early 2010, along with the IBM Cell processor. With partners at three other universities, Brown has also won a planning grant from the National Science Foundation for an industry-university collaborative research center on hybrid multi-core computing. "With so many processors being crammed on a chip, the home computer now starts to look like four or eight or 16 or 32 computers within the box," said Brown. "They are more powerful but they also have to finish their computation 60 times a second in order to provide real-time experiences in the virtual world. We cannot tell a person to wait around while we wait for the result." Brown's team will also continue to explore new approaches to networking using very high bandwidth data backbones. With Peking University, they are currently studying techniques to share virtual-world serving between San Diego and Beijing. 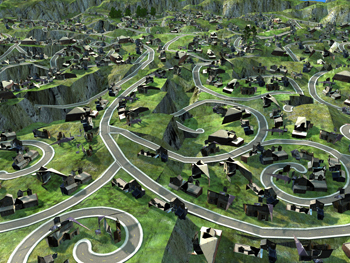 Roads, landscaping and houses build themselves in Brown's "Scalable City", but in the future virtual-world version, thousands of users will be able to tap into the process. UCSD hopes that would now encourage other partners to participate in the newly announced Center for Next-Generation Digital Media at UC San Diego. "In a radical way, we have to envisage what the next generation of digital media will look like," said Brown. "How do significant breakthroughs in computing and infrastructure really change the landscape for what these digital media forms are going to be? The two emerging forms are virtual worlds and digital cinema. We can view each of these as separate entities, or as merged, interrelated entities." Initially, the center will focus on new production platforms for digital cinema, building on existing relationships with Hollywood studios and additional support for the new center from the Center for Research in Computing and the Arts (CRCA), the California Institute for Telecommunications and Information Technology (Calit2), and the San Diego Supercomputer Center (SDSC). 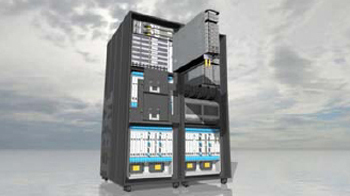 The IBM mainframe computer is being hosted by SDSC, connecting directly to Calit2's digital cinema facilities with dedicated fiber optics and very high bandwidth connections to the Internet and global fiber-optic networks. "Massively multi-user virtual worlds are increasingly important as media and social environments," said Calit2 director Larry Smarr, a pioneer in supercomputing and high-bandwidth optical networking. "Calit2 has made a major commitment to digital cinema through our CineGrid project, and we believe this center can significantly further state-of-the-art practices in digital media of all kinds." Added SDSC director Fran Berman: "The boundaries have blurred between technology and the arts, and the synergistic environment represented by the Scalable City project represents the paradigm shift that is beginning to emerge. SDSC is excited to be hosting the machine and partnering in this important project." "I'm using this virtual world as a platform for developing very high fidelity digital cinema," concluded Brown. "The virtual world can become a way to prototype cinema making -- working through camera shots, scenery, and even actors through avatars. Cinema production can be done faster and with more flexibility."